A group of health professionals have called for clear rights for patients to receive services from primary care providers like GPs and pharmacists in an open letter to the Welsh Government today (Monday 27th November). The letter to Minister Eluned Morgan, signed by over thirty health practitioners,comes as officials prepare to publish language duties in the health system ahead of a vote in the Assembly in the next few weeks. The Government is expected to publish the regulations, known as the Welsh Language Standards, before Christmas. “We are concerned that your draft regulations do not guarantee Welsh language rights for the public in their interactions with primary care providers in the health service. As you know, these services are the public's main point of contact with the health service, so it is crucial that patients are able to access primary care services in Welsh throughout the country. “We believe it is important that these front-line service providers are not exempted from the proposed Standards. This is particularly important as we are talking about some of the most vulnerable people in our society, at a time in their life when communicating in Welsh is very important for their health and for ensuring the best possible treatment. ... We believe therefore that primary care service providers must be subject to the Welsh language Standards under the same statutory framework as the health boards and other health bodies. 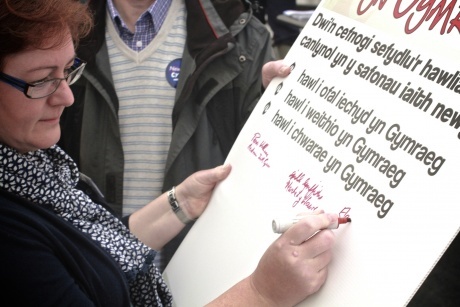 “Steps must be taken to ensure that proposed legislation and subordinate legislation reflect the need to promote the Welsh language in primary care services. A significant body of international research supports such an approach.